You do your best to make sure your dogs are always taken care of. You love the little rascals and want them to get the exercise they need to stay healthy and happy, but you aren’t always around. Bathroom Breaks: Your dog shouldn’t have to go the entire work day without a bathroom break. Dog walking services ensure your furry friend gets a well-deserved bathroom break in the middle of the day. Canine Health: Humans can improve their health by going to the gym on a consistent basis. Your dog can become healthier through exercise, too. 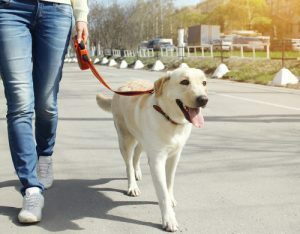 The easiest way to ensure your animal stays as healthy as he or she can is by going on three 20+ minute walks every day. Decreased Bad Behavior: Some dogs have a lot of energy. Often, these types of dogs need a dog walking service so this extra energy can be released. If you don’t walk your dogs, they will struggle to use up all their energy. Unused energy in canines often results in bad behavior. Long walks ensure your furry friends are less likely to bark, bite, chew things they shouldn’t and forget their potty training principles. More Free Time: After a long day of work, you probably don’t have the energy to walk your dog for 30 minutes to an hour. The problem is your dog needs this walk to stay healthy. Investing a little money in a dog walking service could be the answer to freeing up your time after work. Social Interaction: Just like you, dogs need friends, too. If you only have one dog, a dog walking service that will take your dog on walks to meet other dogs or to the dog park gives him the opportunity to socialize. This will help them be more friendly with other animals in the future. If you don’t always have the time, your dog will truly enjoy going on walks with a professional dog walker. A small investment in your dog’s walks will be beneficial in many ways, including the happiness and improved behavior of your furry friend. If you’re looking for one of the best dog walkers in Fairfax, VA, look no further than Paw Pals. We offer dog walking services in the following areas in Virginia: Manassas, Centreville, Clifton, Fairfax, Fairfax Station, and Chantilly. Get in touch today!